Hello. My name is Carin Les, and I am the founder of Missouri based GoDark! MPR. We are an articulate, truth-seeking group, searching for credible answers to explain the paranormal. Good luck there, right? HA! I was hoping to submit an interesting photo my team captured on our trip to Lemp Mansion (Saint Louis, MO.) this past February. It has been authenticated, if that is even possible, by Lemp Mansion and SuperNatural Investigations. I would love to display the photo, and my team is very open to others thoughts, opinions and criticism. After all, that is part of investigating the afterlife. Our follow-up investigation is June 30, 2011. GoDark! MPR has reserved the entire mansion in order to investigate without outside disturbance. Photograph is the sole property of GoDark! MPR. This picture was taken in the William Lemp Suite, correct? I stayed in the room for an overnight visit. During the day, in bright sun, that room is real bright. Did someone take the picture? I see a reflection in the picture of a man standing on the opposite wall of the room from the wall in the picture. I looks like a time exposure to me of someone moving in the frame. I don't see how you can judge this pic if it was the picture frame it only would have been in the picture frame area! although black and while I don't think there is nothing wrong with it so quit hating!!!!!!!!!!!!!!!!! This pic looks really fake rather than being ghostly. It looks real, but it also looks fake. 100 grams of fake, added to 50ml of fakeness, with a sprinkling of Photoshop. It very well could be real or it could be fake, people just want to believe what society tells us. It's called open up your mind and use your imagination until you have actual proof this pic is fake and ghosts don't exist. It just looks like the shutter's been open too long, or a blur. Sorry, but it looks nothing like a ghost. I once saw (with my own eyes) a mist similar to this in an old historical building. I truly believe that this pic is authentic! I've visited your site, and that particular camera you used throughout the night, looks like it is compensating for low light (reduced frame rate, and higher ISO may cause a smearing+blurring effect as well) this may cause mild to extreme motion blur). This is also a particular I've looked at, concerning this camera,(http://godarkmpr.webs.com/apps/photos/photo?photoid=117523609) as you can see the blurring effect is also apparent. When taking photos, A highe ISO in a low light situation, either manual or auto, will cause smearing, strange anomalies and blurring. 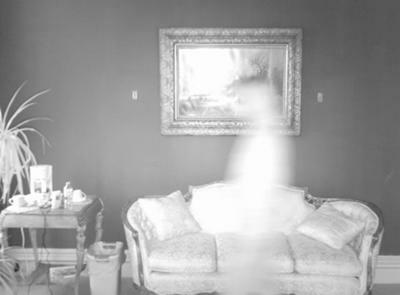 That is one of the creepiest pictures I have seen and I have seen a lot of ghost pics. I live in a house that is very active but I have never got a picture that clear and that creepy. By no means can we say it's a ghost or not but it sure did get my attention. Great catch!! It looks like a live man photographed with too much light. In a scale of 1-10 (10 being a ghost and 1 being a man), Id rate it a 2. My apologies. I honestly think it is real...if not its a good fake :)! Either way it's creepy and I love it!! Congrats on the picture and good luck finding more. How can anybody say that is fake??? After reading what was said about the photograph I think it could very well be genuine. Nope...not fake at all. I think it's really hard for some folks to accept that there just be really be ghosts out there. But I assure you...this is the original photo. No fake, no doctoring, no kidding. But thanks for your input. I downloaded this and really looked at it. I don't think it's a fake at all. Most people who would say that are either upset that THEY themselves didn't catch it or they don't want to believe ghosts are real. It looks genuine to me and I've seen thousands of photographs. This is a man and yes it is possible. If you fake this photo it will not change the fact that it is a fake because if it is a ghost he wont let you fake it.